You find full details of the extra features in the season three boxset in my previous report. In other Enterprise news, Amazon have added a listing for the complete seasons one to four, which they expect to be released alongside season four in April. If it follows the partner of previous multi-season releases, this will be a straight release of the four season sets together with no extra bells and whistles. Meanwhile in one possible future timeline following Enterprise, the limited edition release of Into Darkness, with a QMx phaser has reached another market. 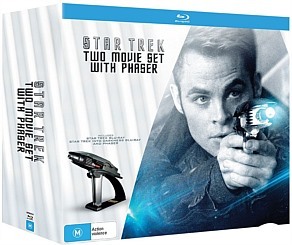 While Amazon has offered this pack as an exclusive in several markets, each with one version or other of the Into Darkness bluray, this latest release has come from JB hi-fi in Australia, who are packaging the phaser with not just Into Darkness, but the first nuTrek film too.